The 1954 and 1955 classes of Capital Page School (CPS) marked their “Golden-Plus” anniversaries recently in Cambridge, Maryland, thanks to classmate Donnie “Mike” Pokrinchak. One of the excursions was a trip to Smith Island in the Chesapeake Bay. The celebrants include, from top left: Browne Greene, in from Santa Monica, California., via Las Vegas, where he represented his law firm at their national convention. Browne was one of the premiere basketball players of that area in the 50’s. Next is Mrs. Jane Goodwin, who is a practicing field instructor in the art of firearms, then Bill Goodwin from Michigan. Bill is the sole survivor of the photo in Life Magazine of the Pages rescuing victims from the shooting by Puerto Rican protesters in the House of Representatives in 1954. Continuing, John Barrison and his wife Virginia traveled from California. John and Virginia operate several businesses including a farm. Mike Revell and his wife Jessica operate a land development company in Virginia. Mrs. Carol Easley and Rex Easley joined from Austin Texas, which explains the hat on Rex. Continuing, Mrs. June Quinn — who keeps Frank Quinn at the grindstone of their Mom-and-Pop auto electrical shop – with Frank shown down front. 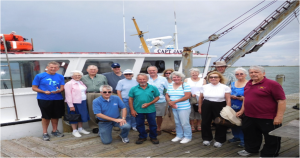 (Frank takes credit for arranging the trip to Smith Island to show the out-of-towners some of the history of the Chesapeake Bay.) Donnie (Mike) Pokrinchak, the organizer of the event and the “real organizer,” his wife Mrs. Jean Pokrinchak. Don and Jean own and operate a land custom business in Pennsylvania. Mrs. Mary Cameron has a full-time job keeping Art in line and Art Cameron still practices law and is involved on Capitol Hill. Art seved as Treasurer and one of the five originators of the first CPS reunion in 2004, along with charter members George Trumpore (CPS-54, deceased) and his wife Sharon, Alan Smith (CPS-54), Jack Allen (CPS-54) and Mike Revell (CPS-55), The success of the 2004 Reunion inspired the future events organized by Ken Smith and Vance Morrison.